A man studies the Sikh holy texts in a room at the Gurduara Sri Guru Singh Sabha, a large Sikh temple in Bangkok. Bangkok is a city of remarkable religious diversity. Although it's overwhelmingly Buddhist, there are large and active Muslim, Christian, Hindu and Sikh communities. In my time here, I've been photographing some of Thailand's many spiritual sides. This week I photographed the Sikh temple. Sikhism is one of the world's youngest major religions. It was founded in 1469 by Siri Guru Nanak Dev Ji. 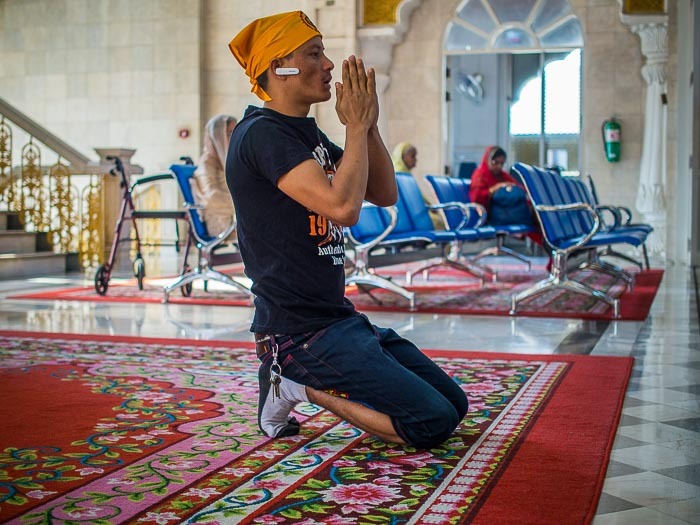 A man prays upon entering the Darbar Sahib, or main prayer hall, at the gurdwara in Bangkok. The Gurdwara (translated it means "Gateway to the Guru") is a large complex nestled in the Bangkok's teeming Little India neighborhood. The temple's current, modern building opened in 1982. It's next to the older Gurdwara, which was established in the early 20th century. Interesting historical fact about the original temple, a wooden structure. During World War II Bangkok was occupied by the Japanese (for a while early in the war Thailand was allied with the Japanese). The Gurdwara was accidentally bombed by allied air forces in World War II (it's just a couple of blocks from what was then Bangkok's main power generating station, which was considered a valid military target). Two 1,000 pound bombs fell through the roof of the temple while it was packed with people seeking shelter from the air raids. Neither bomb exploded and no one was hurt. Clearly, someone was watching over them. Several thousand Sikhs live in Thailand and many have assimilated into Thai society and become Thai citizens. There are Sikh Gurdwaras in Chiang Mai, Pattaya and Phuket. 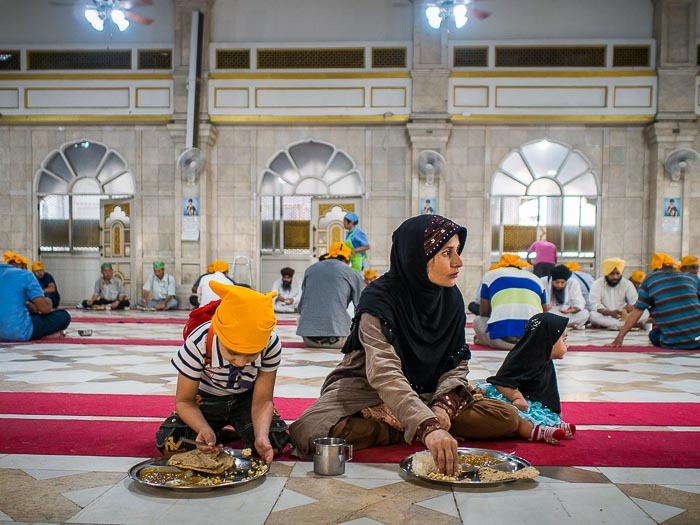 A Muslim woman and her children participate in the Langar, the community meal served everyday at the Gurdwara. People of all faiths are welcome to the meal. 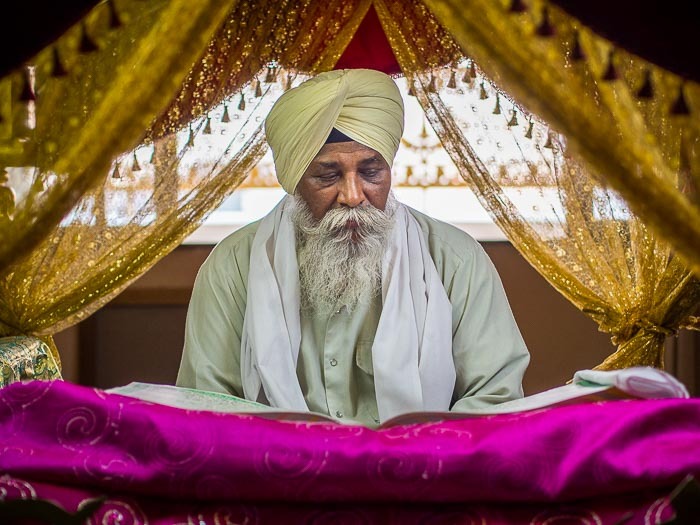 There are more photos from the Gurdwara in my archive or available from ZUMA Press.